New data from Alipay shows that 82% of the transactions made via its platform last year were done through mobile devices, mainly smartphones. This puts Chinese m-commerce at an all-time high and, given that Chinese start-ups raised a record $58.8 billion from investors last year, it’s clear China is taking a strong lead across the tech sector. For retailers in Europe to succeed in m-commerce in 2018, they can learn a lot from looking to the East at multi-purpose apps like WeChat, that show just how connected businesses and consumers can become. In Europe, the Uber generation of app users are becoming increasingly picky about the apps they download, and what was once a sellers’ marketplace is now rapidly turning into a battleground for space on already overcrowded smartphone screens. M-commerce success is no longer a case of simply deciding to create an app - it’s about making it as desirable as possible for customers to download in the first place. For retailers that already have mobile apps, it’s time for them to be revamped and rebuilt. Surveying the customer base and taking feedback is a good place to start as you have to know exactly what users want before embarking on any updates. Ultimately, it doesn’t matter where a company is in its app creation cycle; it still needs to optimise the user journey. In 2018, consumers expect minimalistic, utilitarian design, so a new app needs to be perfectly streamlined and the customer journey should be frictionless from start to finish. Brands and developers need to bear in mind the emotional pain points of consumers when they’re building an app. If download demands too much information from the consumer at the outset, then it’s likely they’ll leave it or delete it halfway through, meaning you’ve fallen at the first hurdle. If you make it past the first fence, you’ve got to be ready to hit them with opening offers, interactive content and simple, frictionless purchasing. The best apps tend to save consumers time, money or both. Many big-name brands are already getting it right. Companies like ASOS and McDonald’s have spent a lot of time considering their user interface (UI), and while their apps look good, they are also incredibly simple to use and have a super-fast download time. 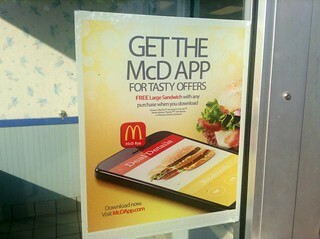 Added to that, the McDonald’s app for the US market offers new users a free burger as a welcome gift, meaning even the most luddite of McDonald’s lovers are more likely to take time to download the app. The app remains on their device at least until they have visited a restaurant to redeem the offer, and the more time it is there the less likely they are to delete it. However, it’s not just the free offers that will keep customers happy. The day-to-day workings of the app are vital. If the download time takes too long or the app takes more than three seconds to load, then customers will abandon ship, and you’ve lost a potential sale. Once you’ve got the frictionless download and load times down, the next stage on the user journey is to keep them engaged. You can do this by providing them with plenty of high-quality, interactive content that will prompt repeat visits. Gamification is a trend that continues to grow in the mobile space. Younger users respond particularly well to in-app, ‘instant win’ games that add value beyond the shopping experience. The content must be fresh and enticing at all times – your product teams will need to think about refreshing the games and content at least on a weekly, if not, bi-weekly, basis. Customers are creatures of habit and they’ll soon learn when new content drops on their favourite app. If you keep to a schedule, you will soon see repeat visits and engagement increase as customers return, curious to see what this week’s offer is – and more importantly, what they stand to win. There are key purchasing times throughout the year, like Christmas, Black Friday and Cyber Monday, that offer other ways to elevate app usage. Associated incentive or loyalty programmes can offer bonus points or money off if users have interacted with the app on a regular basis. Additionally, in-app games can be adapted to a particular holiday or shopping day, offering users prizes or larger discounts. Ultimately, though, it doesn’t matter how many games, prizes or other incentives your app offers. What will keep customers loyal is a frictionless, headache-free experience when using it. If your app offers the power to purchase, checkout has to be streamlined and the amount of information required kept to a minimum, while ensuring that data is protected and security high. Naturally, this will correspond to mobile checkout platforms such as Apple Pay, Visa, Android Pay et al. While these are the well-known usual suspects, it is always worth checking out up-and-coming services with significant numbers of customers. Aside from offering consumers an easy way to insert their payment details, apps should offer a guest checkout option as well as enlarged fields on the checkout page – there is nothing worse than squinting at the screen trying to make head or tail of some tiny print at this peak emotional time in the purchasing journey. Lastly – say thank you to your customer. It’s simple, yet so effective and gives them an incentive to return. If you’re finding it hard to map your customer journey through your mobile purchasing funnel, then it really is time to take a long, hard look at your app to see where the pain points are and whether they match your customer’s needs. If they don’t, you’ll need to go back to the drawing board. Competition is fierce and you can’t afford to be left in the starting stalls.